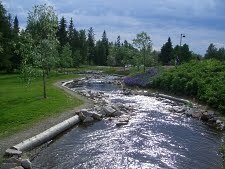 Oulujoki fish passage: Most Finnish rivers are affected by river engineering, which has hindered the natural migration of the native anadromic fish species. The loss of fish production is usually compensated by yearly stockings to the rivers and sea areas. Anadromic fish populations cannot however maintain their genetic viability without the completion of their natural reproduction cycle. Fishways enable the migration of adult fish to their spawning areas and in some cases also the outmigration of smolts and kelts. Construction of the fishway in the Merikoski was the first step in restoring the Oulujoki river for migrating fish. Merikoski hydro power plant was the lowest obstacle for fish migration before the fishway was constructed in 2003. The constructed fishway now enables salmon and other migrating fish to rise up 40 km to the lower reaches of the Oulujoki river and also reach two tributaries. 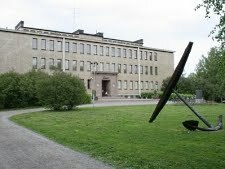 Juveniles of some migratory fish species are planted into Merikoski every year. The amount and types of the migrating fishes are monitored with the help of underwater video camera and fish counter. 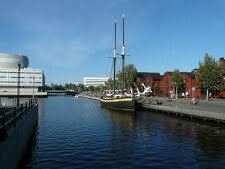 Culture in the City of Oulu: During this relaxed walking excursion different urban green areas and culture destinations will also be seen in the delta of the River Oulu. 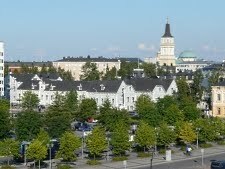 The visiting points will be the Oulu Cathedral, Ainola park and the Northern Ostrobothnia Museum, Market Square and Priki park. Priki park is a rare habitat of the wood anemone (Anemone nemorosa) and was left in its natural state in the middle of the housing blocks, build in the 2000s.